The so-called ‘Coso Artifact’ (as an American object, I’ll allow it to keep its American spelling) was found on 13 February 1961, by Wallace Lane, Virginia Maxey and Mike Mikesell, who were looking for minerals to sell in their shop in Olancha, California. They were about nine kilometres (6 miles) north-east of Olancha, near the top of a peak about 1,300 m (4,300 feet) high. The next day, while cutting through one of the geodes, Mikesell ruined a nearly new diamond saw blade. The explanation was soon found: instead of a cavity inside the supposed geode, there was a circular section of hard white material resembling porcelain. In the centre of this was a 2 mm circle of bright magnetic metal. Around the porcelain was a layer of corroded copper and, outside that, a layer of mineral that was hexagonal in section. The outer surface of the specimen was encrusted with fossil shells and two non-magnetic metal objects that appeared to be a nail and a washer. A geologist informed the finders that the nodule had taken at least 500,000 years to form, but this informal analysis was never published. Later, the creationist geologist Ron Calais (who worked as researcher for mystery-monger Brad Steiger) examined the object and took photographs and X-radiographs of it. 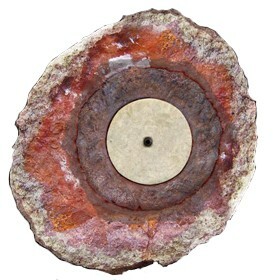 The X-rays showed that there was still more of interest embedded inside the ‘geode’, including a tiny metallic helix at its upper end and a metal, presumably copper, sheath covering the porcelain cylinder in the other half of the rock. Unfortunately, the location of the artefact is no longer known and Wallace Lane, who seems to be its last known owner, is thought to have died, so a modern re-examination cannot be performed on it. The discoverers seem to have been ambivalent about the object: Mrs Maxey is quoted as saying that it might be “something that lay in a mud bed, then got baked and hardened by the sun… Or else it is an instrument as old as legendary Mu or Atlantis”. Their later attempt to sell it for $25,000 suggests, though, that they believed it was unusual and in some way important, as does their careful control over who was allowed to see it, let alone handle it. 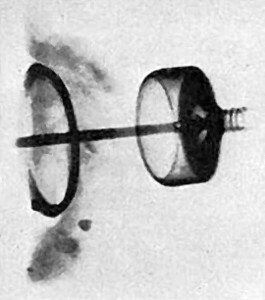 Paul Willis, the editor of INFO Journal, suggested that that it might have been a spark plug, although some features, such as the metallic helix, puzzled proponents of this hypothesis and led some to speculate that it might have been some type of communications device. Some creationists and others have presented the ‘Coso Artifact’ as evidence for advanced technology in ancient civilisations. Unfortunately, the whole story can be unravelled very easily. First of all, the object was not a geode. Geodes have very precise characteristics – a thin outer shell of dense chalcedonic silica, and a layer of quartz crystals internally – which the ‘Coso Artifact’ does not possess. The material was described by one of the discoverers as hardened clay that had picked up pebbles, a nail and a washer, with a hardness of 3 on the Mohs scale, much softer than a geode. Secondly, the resemblance of the object embedded within it to a spark plug is a vital clue. Far from being evidence for internal combustion engines in the remote past, research by Pierre Stromberg and Paul Heinrich of the Pacific Northwest Skeptics has shown that it can in fact be identified with a spark plug manufactured by Champion in the 1920s. Is this your own opinion or are you an expert on the subject? If you actually read the article, you’ll notice that I credit the work of other people. Probably a spark plug belonging to some older model time machine. So you are saying that the ancient alien spaceships used Champion spark plugs? Do you work for Champion?